And the winner is? Ultraman Joey Anderson ! 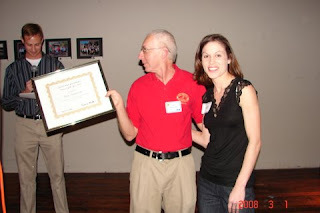 This past Saturday Evening, March 1st the NCRC held it's Volunteer Appreciation Party. In the past it had been a sit-down dinner and only open to volunteers that had worked at least 20 hours and those with 40 or more could invite a guest for free. This year the format was changed to a more casual affair and anyone in the club could pay $15 and attend. Almost everyone I spoke to liked the new format since it allowed more club members to attend, yet still reward the volunteers. In years past there were racing teams at most local races from clubs and other groups but now most races don't offer to team competition. One of the things that the NCRC has tried to do recently is to offer something for the more competitive members of the club. Last year we ( the club executive committee) asked for volunteers to step forward to organize a racing team for the club. Mike Zimmerman, owner of The Athlete's Foot stepped up to sponsor the team and supply shirts and singlets. Which brings me back to the photo and the opening of this story. That is me accepting the award for NCRC Racing Team Grandmaster of the year. I was surprised to receive the award, but then I think I may be the only Grandmaster Male on the Team? Well, although I didn't compete in any short distances the past year, except to run with Karla for fun, I did have a pretty good year at the longer stuff. I opened up the year with a 100 mile PR of 23:15 in Rocky Raccoon and set several course pr's in some 50K's. I ended up the year with a 50K pr at Derby and was the first Grandmaster for the 2nd year in a row. The young man in the background is Travis Wills, the men's team leader. The very pretty young lady I have latched onto in the picture is our ladies team leader, Erin White. Ahh, if only I was 25 years younger. Thanks to all the volunteers that made this evening a huge success. I look forward to another great year for the NCRC and more racing!